The Lodi Railroad Museum is a 501(c)(3), non-profit, educational and historical organization. 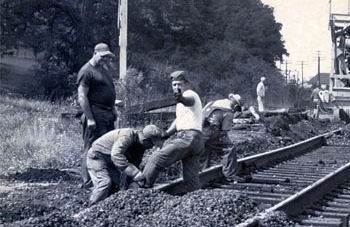 The mission of the Lodi Railroad Museum, Inc. (LRRM) is to inform and educate the public about the railroad’s effect on the Village of Lodi and Harrisville Township. LRRM was established on December 21, 2005 with the short-term goal of saving Lodi’s ex-Wheeling and Lake Erie Railway Company (W&LE) depot. The long-term goal is to restore the depot as it was in the late 1920’s. LRRM is a member of the Ohio Rail Tourism Association (ORTA). LRRM also has Operation Lifesaver Certified Safety course presenters to educate the public about railroad crossing safety and trespassing on railroad property. ...to become part of a dedicated team striving to save our past and lay new track to the future. LRRM is currently working to restore our former Wheeling & Lake Erie Railway depot in Lodi, Ohio with plans to turn it into a museum of local railroad history and its influence on our community. The organization also owns ex-Norfolk & Western Railway #557731/W&LE class C8 caboose #231 built in 1949 by the W&LE. For more information on how to join, please visit our Membership page.